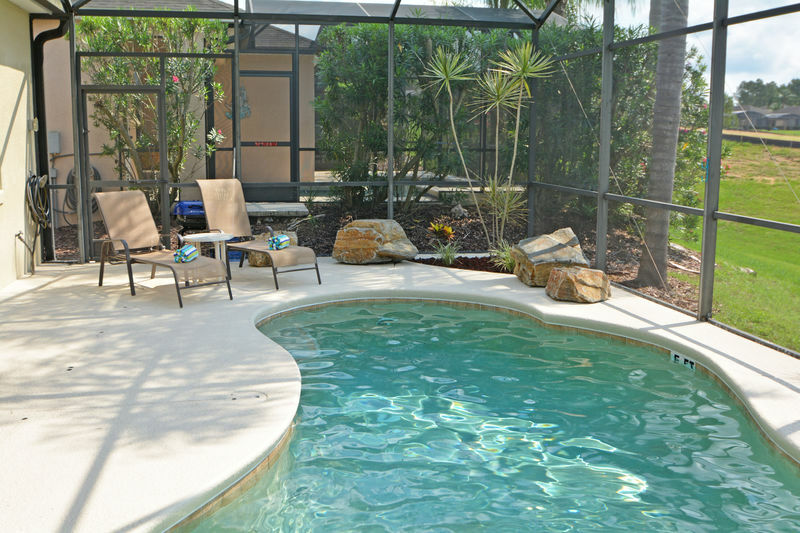 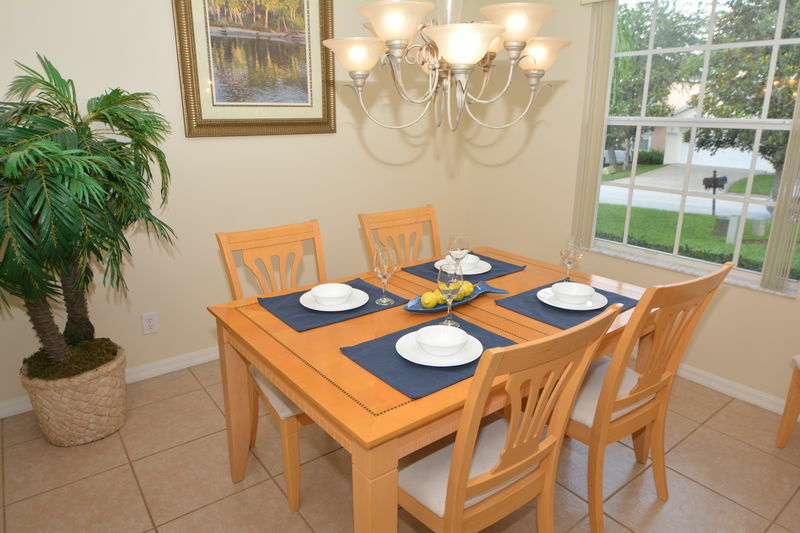 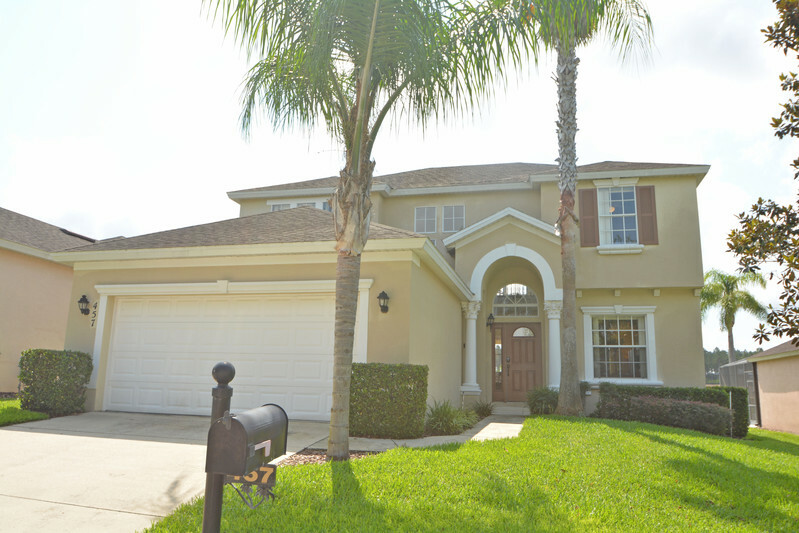 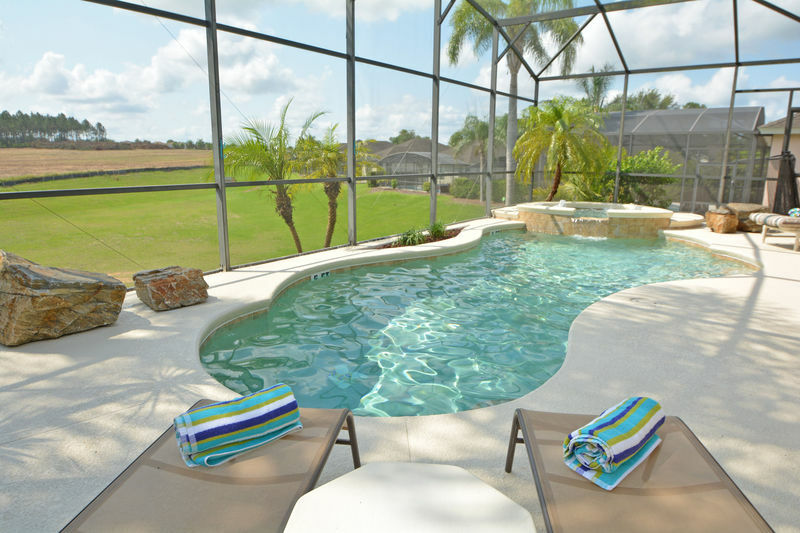 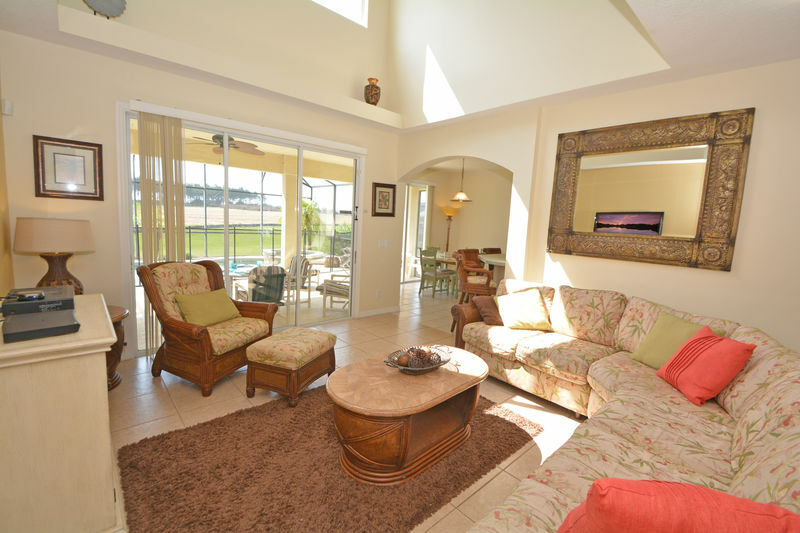 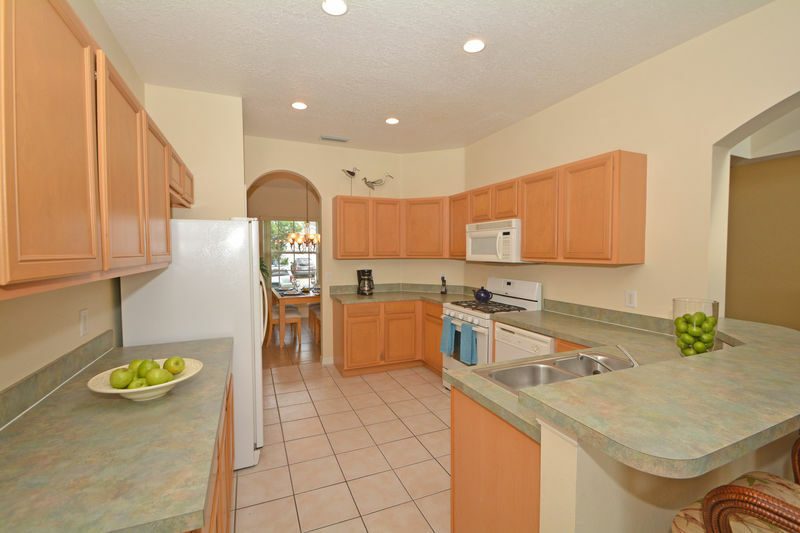 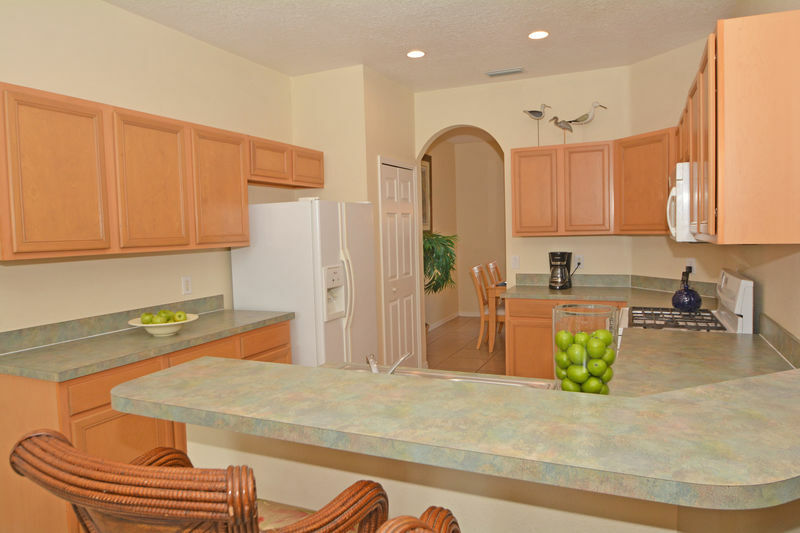 A beautiful 5 bedroom, 3.5 bathroom pool home which has been recently updated and furnished to a very high standard. 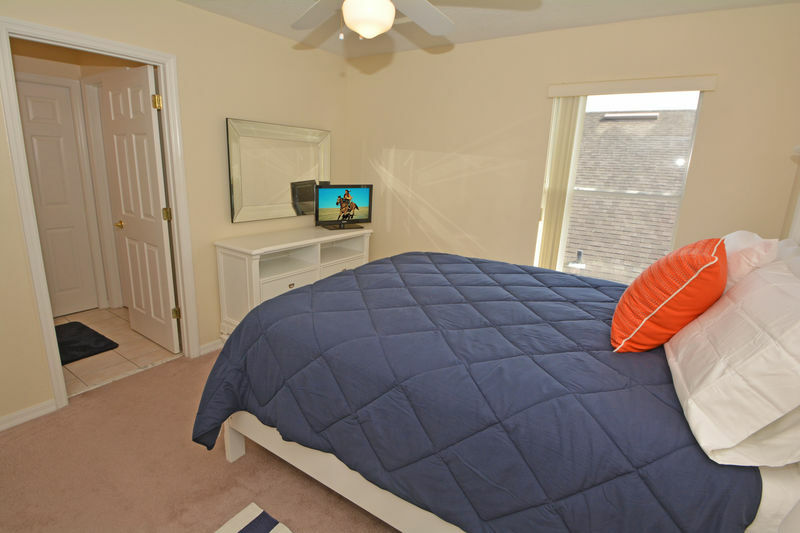 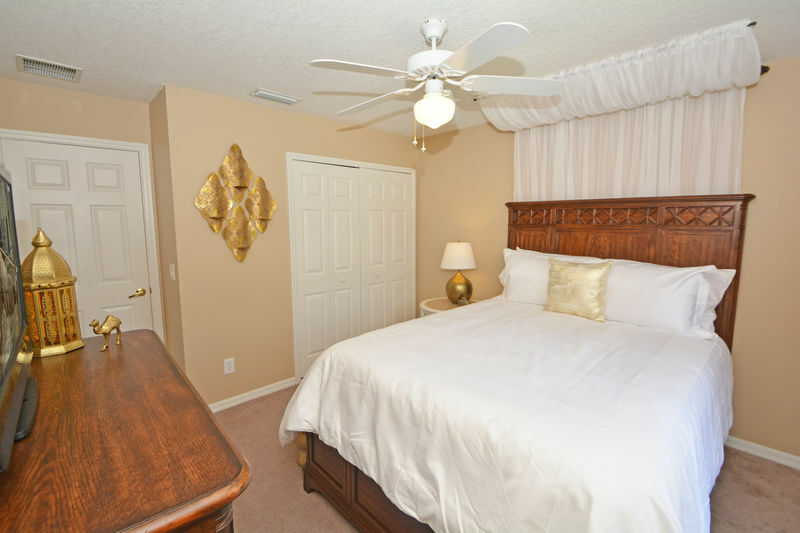 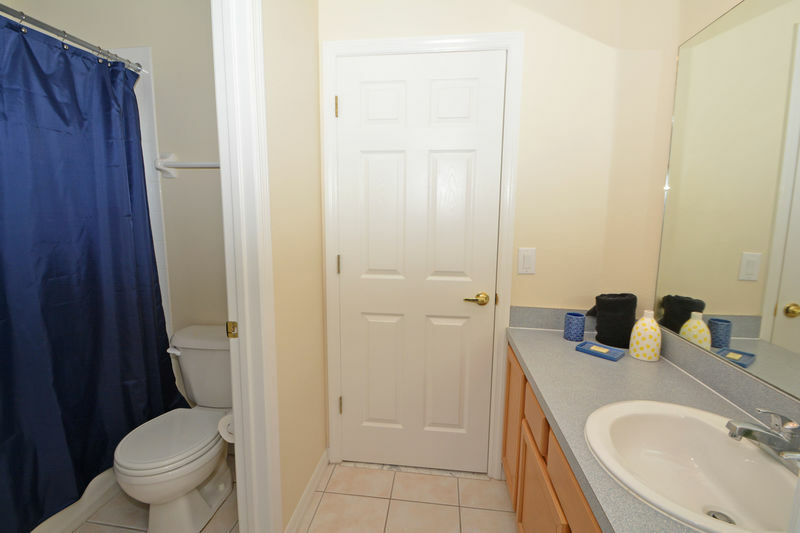 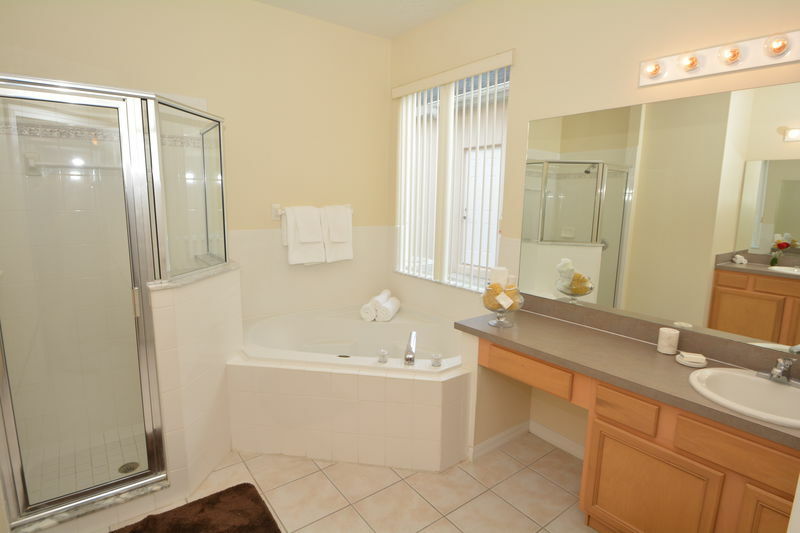 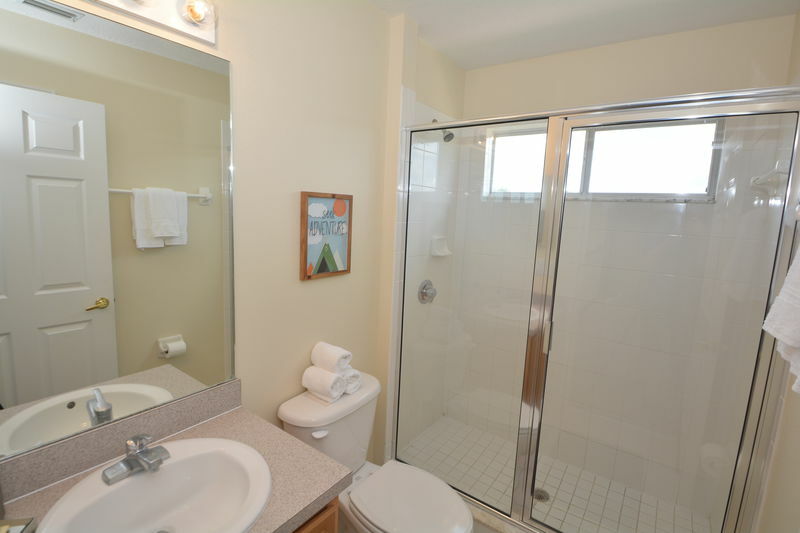 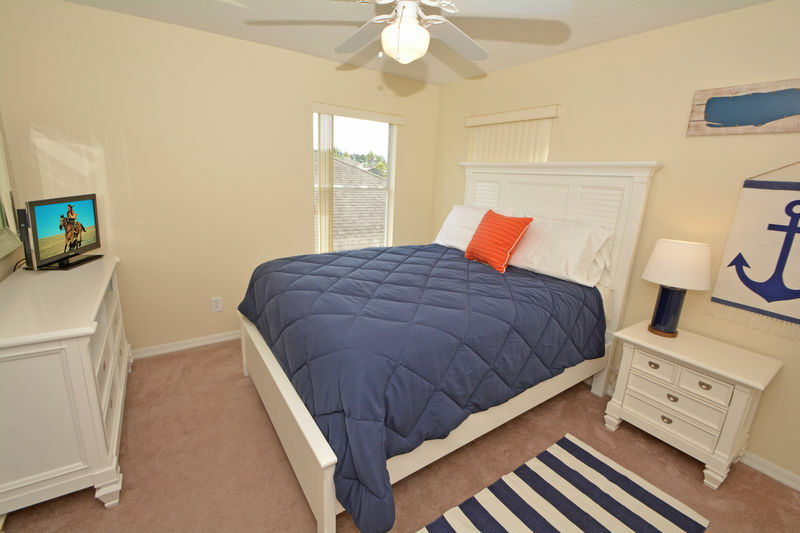 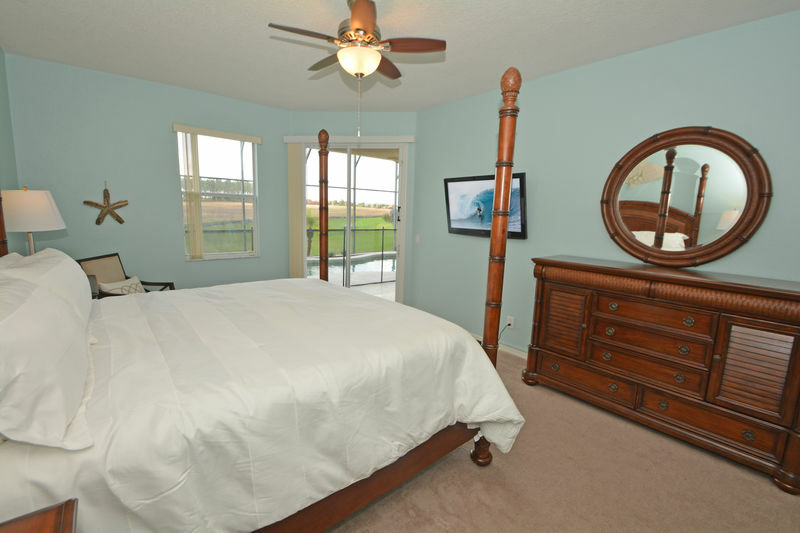 Each bedroom has it's own clear and tasteful theme and all bedrooms have TVs. 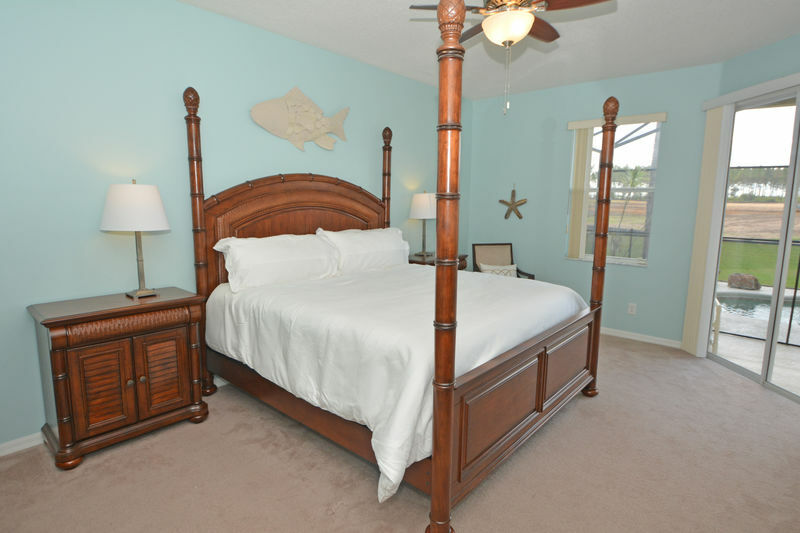 The first floor master has a relaxing pastel blue theme with 4 poster bed, sliding doors to the pool area, walk in closet and en-suite bathroom with corner tub, separate shower, his n hers basins and WC. 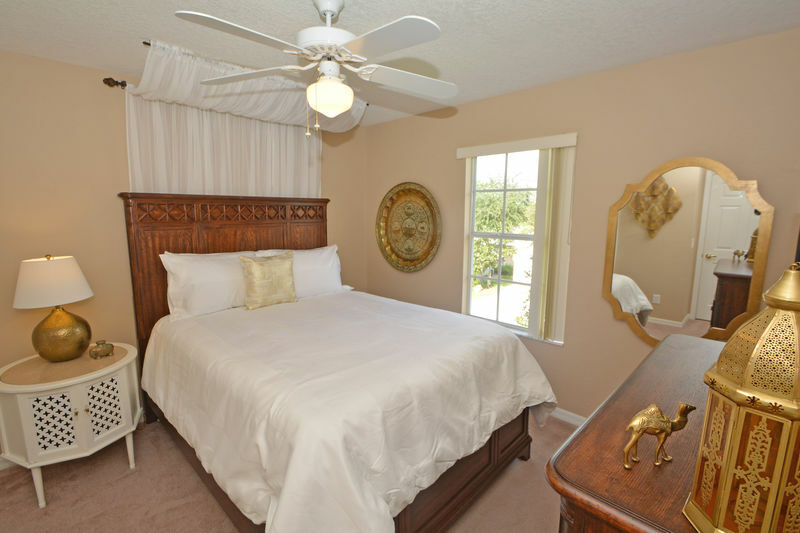 The upstairs has a distinctly Arabian theme with gold accents and crisp white bedding, sliding doors to the pool area, flatscreen TV, closet and en-suite bathroom. 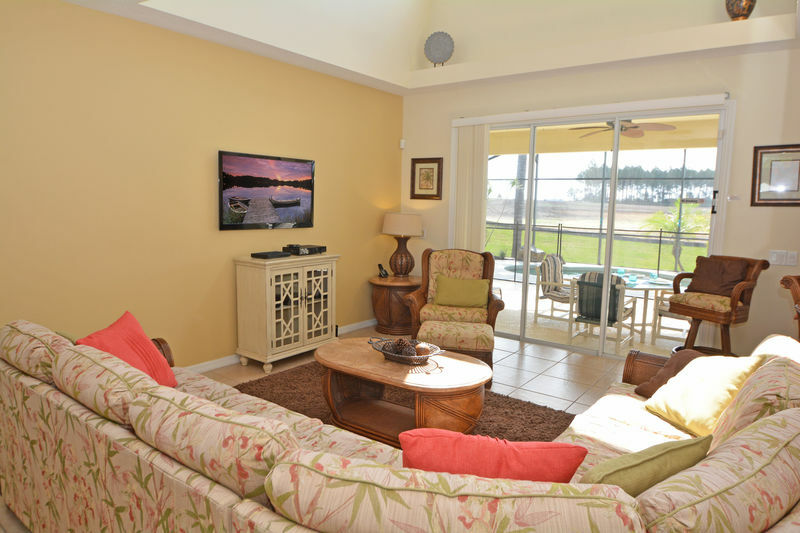 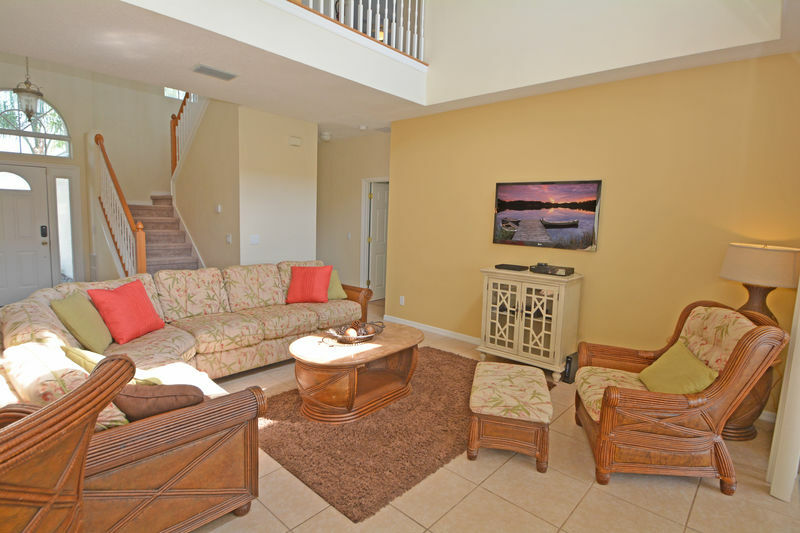 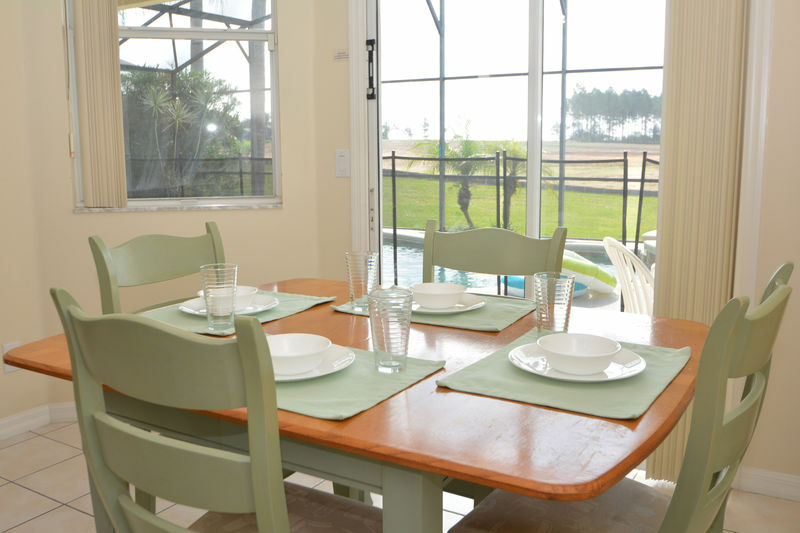 There are two dining areas both capable of seating 6, a comfortable family seating area with ample seating, wall mounted flatscreen TV, DVD player, cable TV and sliding doors to the pool area. 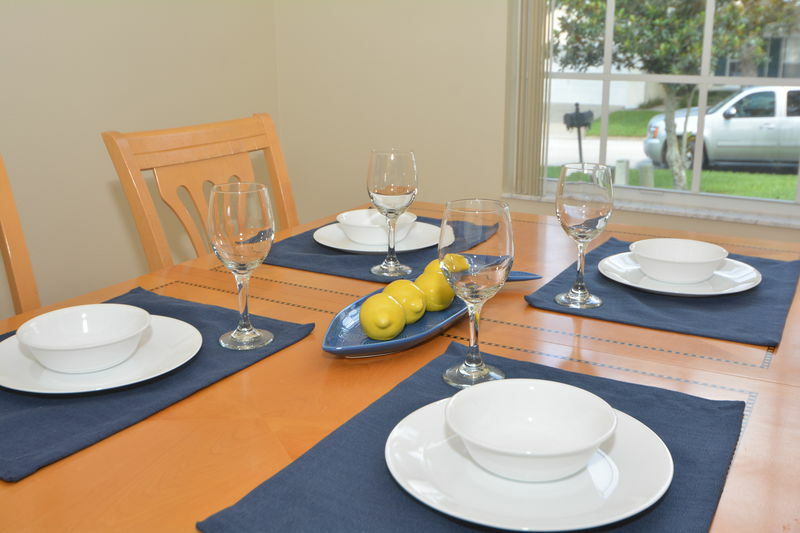 The kitchen is fully equipped for family meals at home and has an electric oven/hob, microwave, dishwasher, double sink with disposal unit, large American fridge with water/ice dispenser and bar seating area for 4 people. 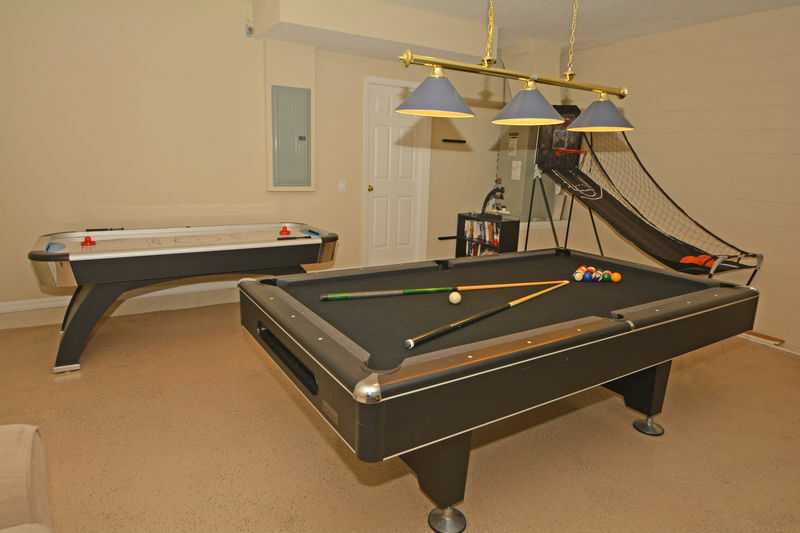 The utility room with washer and tumble dryer leads to the double garage which has been converted to a games room with basketball game, pool table and air hockey. 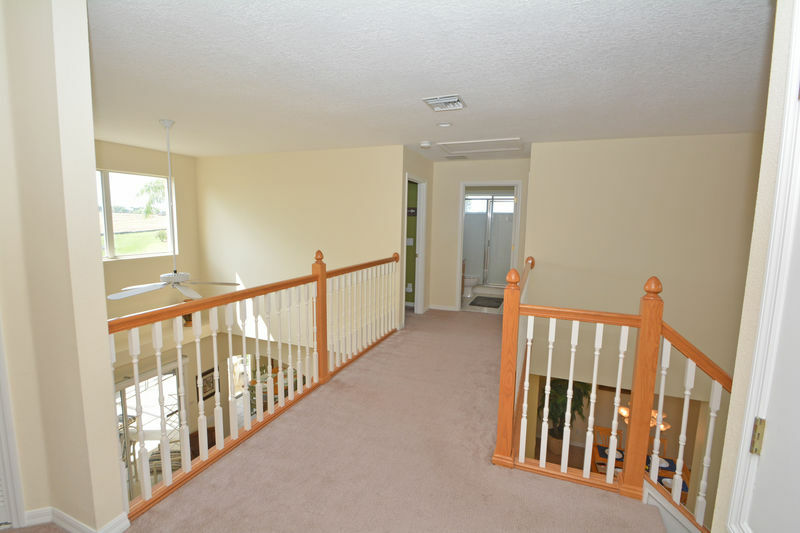 Upstairs there is a bright and airy landing leading to the remainder of the bedrooms. 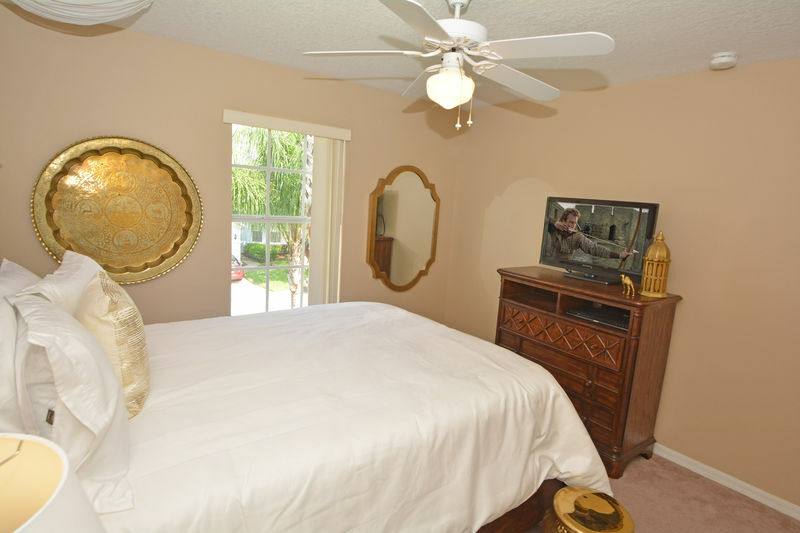 Bedroom 2 has a distinctly Arabian theme with gold accents and crisp white bedding, flatscreen TV, closet with shared bathroom with bedroom 5. 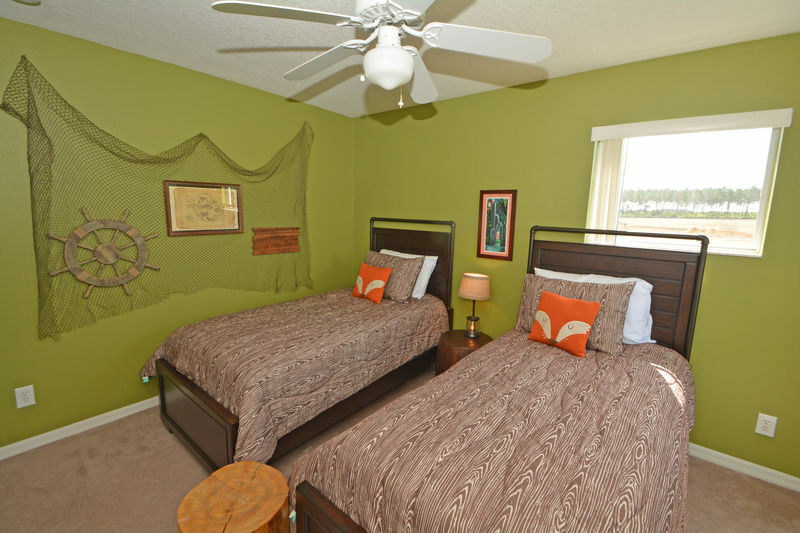 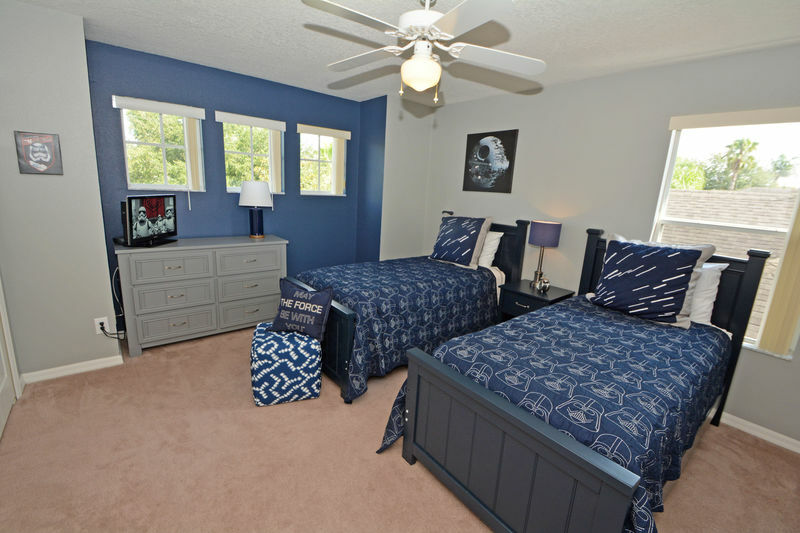 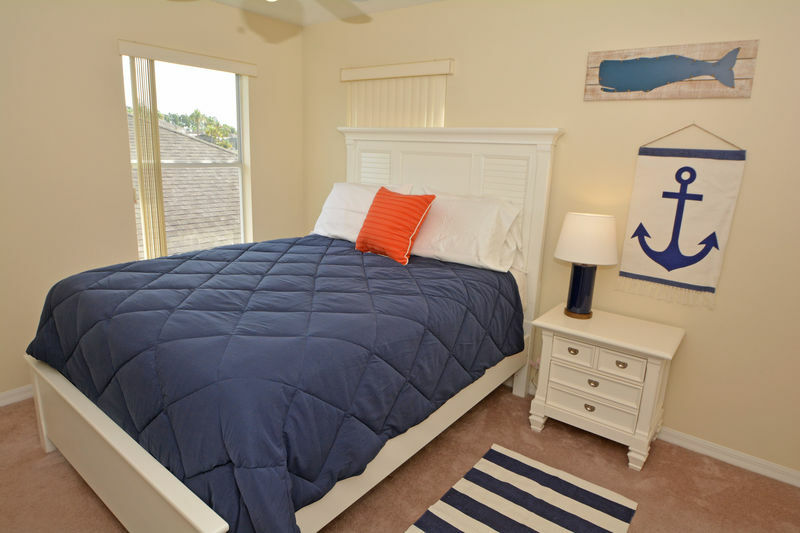 Bedroom 3 has a queen bed and a nautical theme, flatscreen TV, closet and a Jack and Jill type bathroom which it shares with bedroom 4. 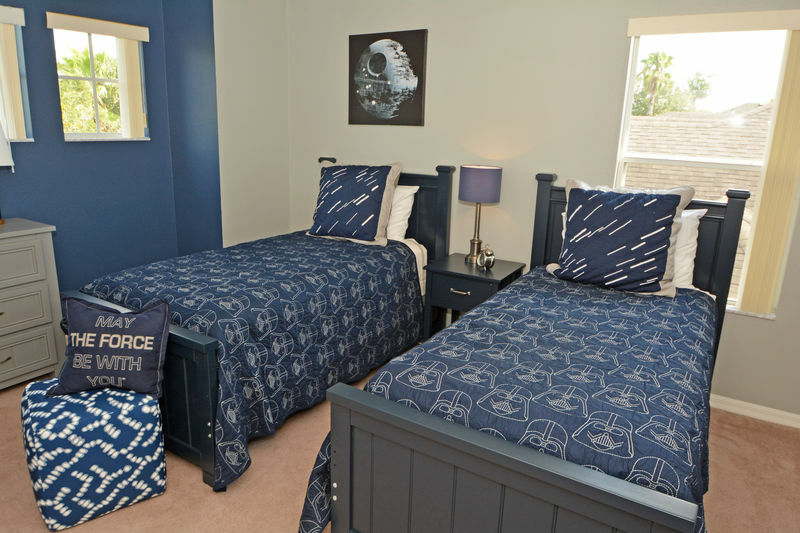 Bedroom 4 has twin beds, flatscreen TV and a Star Wars theme. 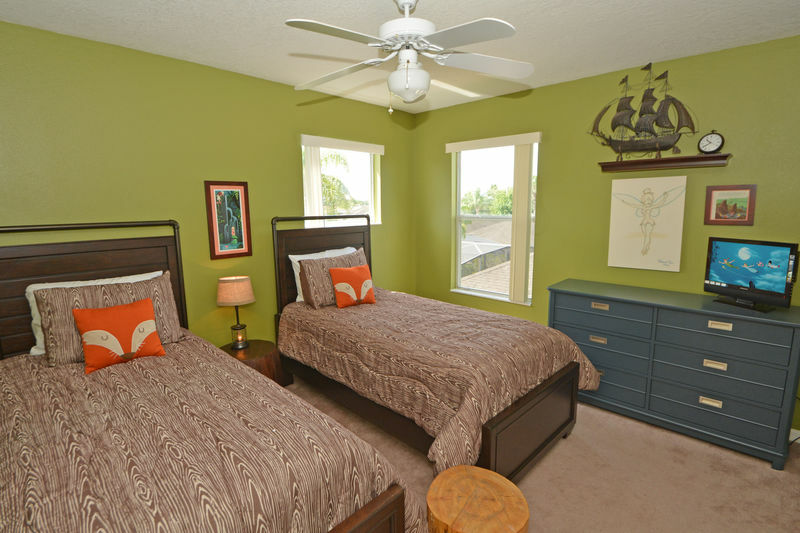 Bedroom 5 has twin beds, flatscreen TV and a Peter Pan theme. 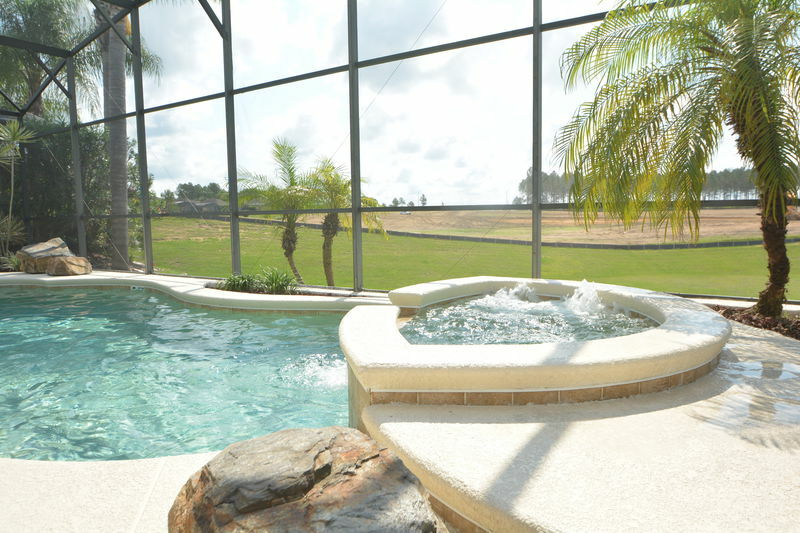 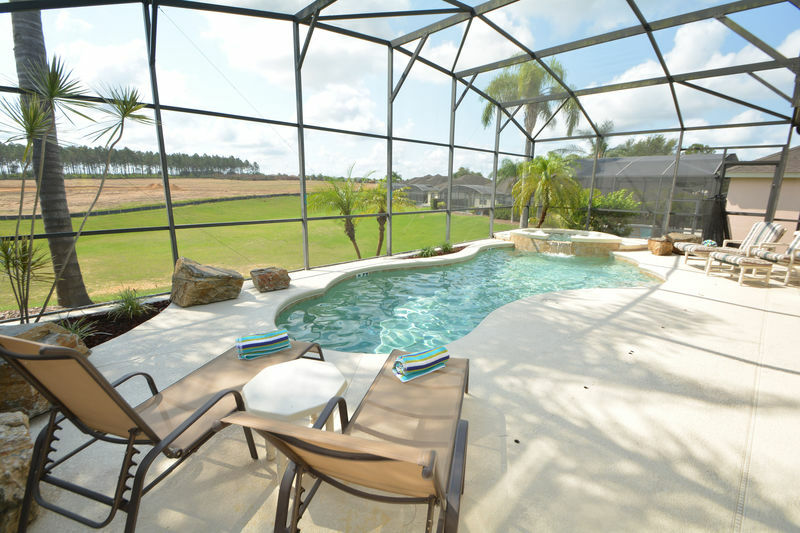 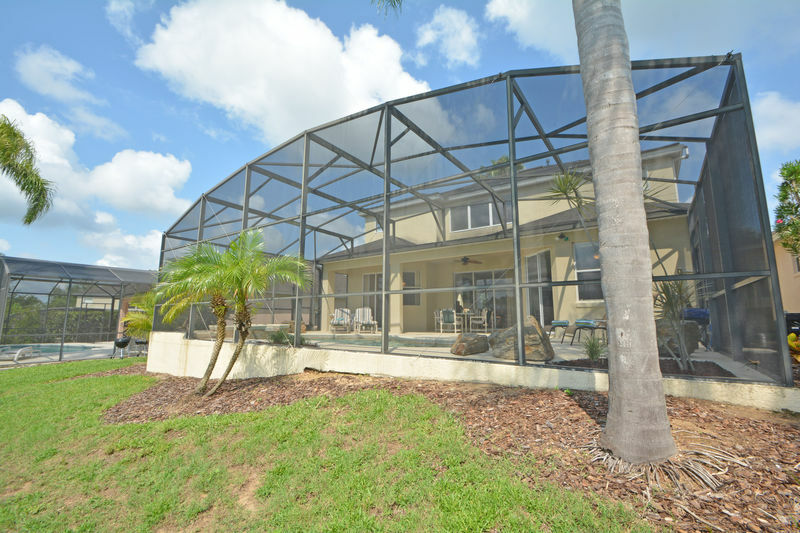 Outside there is a fully screened in pool and spa with lush planted areas. 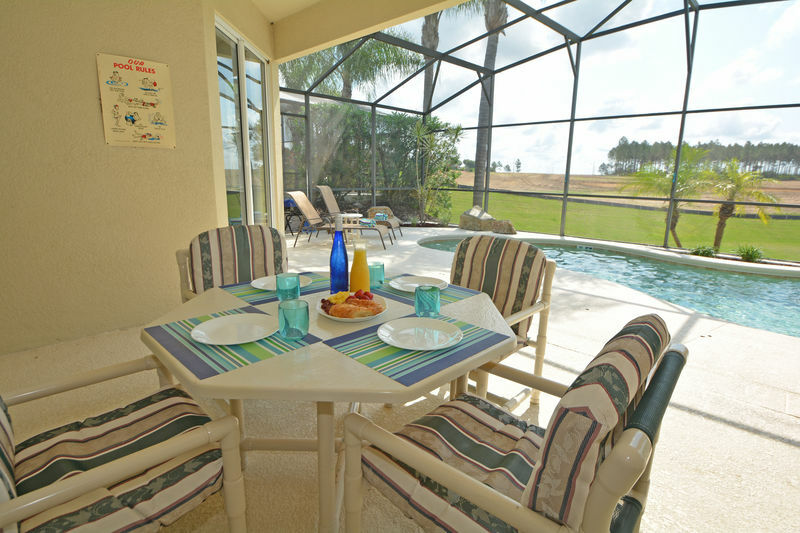 A shaded lanai gives a cool space to relax and eat at the table seating 4, there are two reclining chairs with footstools as well as two sun loungers. 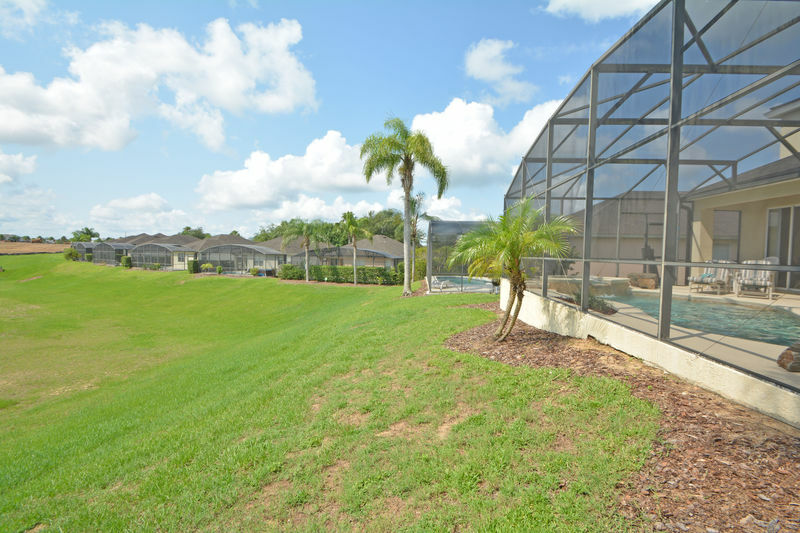 The house backs onto a wide grassy area.